The addition of statins to standard care in heart failure (HF) patients remains controversial in clinical practice. Large-scale clinical trials failed to show mortality benefits, but uncertainty persists in real-world settings. We evaluated whether the prescription of statins at hospital discharge is associated with a reduction in all-cause mortality at up to 1 year of follow-up in HF patients. We analyzed data from Epidémiologie et Pronostic de l’Insuffisance Cardiaque Aiguë en Lorraine (EPICAL2) cohort study of 2254 hospitalized acute HF patients who were admitted to 21 hospitals located in northeast France for acute HF between October 2011 and October 2012 and who received statins at discharge compared with patients who did not. 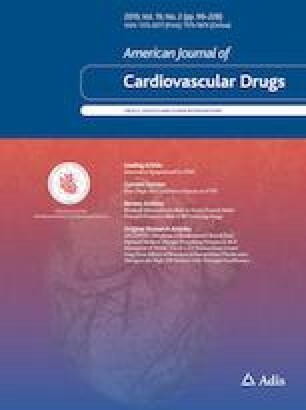 We used propensity score matching and instrumental variable analyses to estimate the treatment effects of statins, and a multivariable Cox proportional-hazards model to examine survival with statin use, adjusting for patient demographics, HF characteristics, medical history, comorbidities, drug treatment and other known potential confounders. We plotted Kaplan–Meier survivor curves, and used log-rank test to determine the equality of survivor functions. We included 2032 patients in this investigation: 919 (45%) in the statin-treated group and 1113 (55%) in the control group. The estimated average statin-treatment effects for all-cause mortality in HF failed to demonstrate a significant effect on mortality [Z = − 1.73, 95% confidence interval (CI) − 0.11 to 0.007, p value = 0.083, and Z = − 0.95, 95% CI − 1.34 to 0.46, p value = 0.34] for propensity score matching and instrumental variable analyses, respectively. Moreover, the Cox proportional-hazards model showed that statin prescription was not significantly associated with the rate of death (hazard ratio = 0.85, 95% CI 0.66–1.11, p value = 0.26), adjusted for all confounders. In patients with HF (and reduced or preserved ejection fraction), the prescription of statins did not appear to be associated with better survival after 1 year of follow-up in the EPICAL2 cohort. We cannot exclude that a subpopulation of HF patients may have some benefits compared with the whole HF population or that there might be a lack of power to show such effect. The authors thank all physicians from the 21 participating centers in the EPICAL2 clinical cohort study (Hôpitaux de Brabois et Hôpital Central, CHU Nancy; CH Luneville; Espace chirurgical Ambroise Paré Nancy; CH Alpha Santé Mont-Saint-Martin; CH Pont-à-Mousson; CH Saint-Nicolas Verdun; Hôpital Bon-Secours CHR Metz; CH Freyming Merlebach; Hôpital Sainte-Blandine Metz; Hôpital Bel Air CHR Thionville; CH Marie-Madeleine Forbach; Hôpital Alpha Santé Hayange; CH Saint-Nicolas Sarrebourg; Hôpital Lemire Saint-Avold; Hôpital des Armées Legouest Metz; Clinique Claude Bernard Metz; CH Saint-Charles Saint-Dié; CH Jean Monnet Epinal; CH Neufchateau; CH Vittel). We would also like to thank all participants and patients of EPICAL2. Special thanks are due to Patrick Taffé, statistician, for counseling. Conception and design: MA, BB, and NT. Writing the initial draft of the manuscript: MA. Contribution to writing and editing: MA, NA, BB, and NT. Critical analysis: MA, NA, MS, BB, and NT. Data management: MA and MS. Statistical analyses: MA. Proofread and approved the final version of the manuscript: MA, NA, MS, BB, and NT. The EPICAL2 cohort study received a grant from the National Hospital Program of Clinical Research (PHRC 2009) of the French Ministry of Health. MA, the corresponding author, received a financial Grant (2014.0193) from the Federal Department of Economic Affairs, Education and Research (EAER), Switzerland. All researchers were independent from funders. The authors, MA, NA, MS, BB and NT, declare that they have no potential conflicts of interest that might be relevant to the contents of this manuscript.